How does one review a book that has become such a significant part of the culture of the English-speaking world? Even people who’ve never heard of George Orwell, Oceania, and Winston Smith have probably heard the phrase “Big Brother is watching you.” 1984 gets referenced in news stories about wiretapping, in reports of employers tracking their employees’ online activity, and on primetime reality television. Obviously, 1984 has had an impact. But is it a good book? I first read 1984when I was in high school. In fact, it may have been my introduction to dystopian literature. Coming to it 20 years later on audio, I could remember only the broadest outlines of the plot and that I loved it as a teenager. After listening to the audio version, I can report that the book still sends chills down my spine. The part of Orwell’s vision that is most well known is the picture of constant surveillance. Even people who’ve never read 1984 have heard of Big Brother, who represents the Party that governs the nation of Oceania, a country where all citizens are constantly monitored lest they step out of line. This lack of privacy is not, however, the only means of control that the Party has. News stories and other documents are constantly being “rectified” so that Big Brother appears to always be correct. The language of Oceania, newspeak, is being revised so that it’s impossible for citizens to even have the words to think of rebellion. Indeed, negative thoughts about the Party have become a crime. 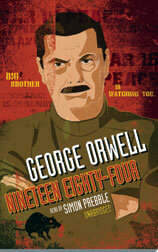 The protagonist of the novel, Winston Smith, is a thought criminal. He knows that the Party is not quite right, and so he begins to rebel in small ways, starting a journal, purchasing a useless paperweight. Eventually, he meets a young woman named Julia and begins an affair. Once the two have something to live for, they start taking bigger steps against the Party, and these acts bring them to the Ministry of Love, where rebels learn to love Big Brother. The Party’s ability to get inside people’s minds and control their very thoughts is no doubt the most frightening part of 1984. Although it’s hard to believe that such control is possible, Orwell paints a convincing picture of how such a thing could be done. The audio version is not bad. At first, I thought I wouldn’t be able to stick with it because the reader uses a bored sort of monotone in the earliest chapters of the book. However, a more animated voice wouldn’t really suit the novel in those early chapters, and it seemed to me that the reader got more animated as the book went on, which also suited the story. With books like 1984, the obvious question to ask is whether our society is headed in the direction depicted in the book. I’m inclined to think that the very existence of books like this serve as a preventive measure. We’re nervous about being monitored because we see here where that can lead. It did occur to me that the movement toward electronic-only information makes it easier for news to be “rectified” if earlier reports prove to be inconvenient. But do I think such widespread control is possible? If anything, I think the electronic age has made open rebellion easier and the control of information more difficult. There are too many voices now for one ideology to gain utter control. Still, I do think that small groups of people can be controlled in this way; for example, when we only bother to listen to one point of view, we put ourselves in danger of having our thoughts controlled by those who share this point of view. So we make ourselves citizens of our own mini-Oceanias and all those on the outside are the enemy. If the multiplicity of voices out there help keep us free, we should be sure to give a fair hearing even to those voices that are different from our own. 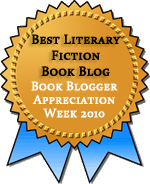 This entry was posted in Audiobooks, Fiction, Speculative Fiction. Bookmark the permalink. I have a hard time seeing our society as Oceania, but good point about the small-groups with closed minds: that is rather the same thing (on a smaller scale). Rebecca: Yeah, I think the multiplicity of online voices makes the large-scale thought control much more difficult, but I see lots of people forming little echo chambers because they get all their information from just one or two sources. In the end, it amounts to the same thing.